The Rotary Club of Sowerby Bridge will be holding a Christmas Concert on Friday 1 December 2017 6pm-9pm at St. Paul’s Methodist Church, Sowerby Bridge HX6 2EQ. 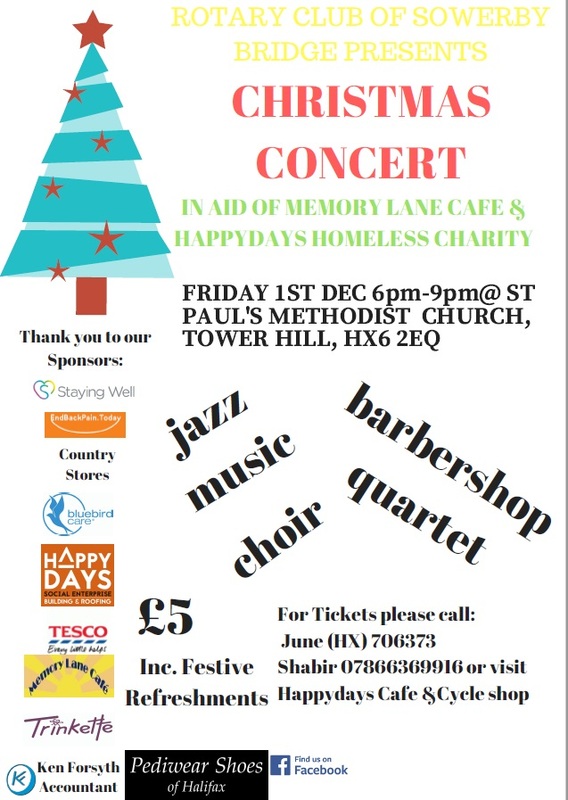 For just £5, which includes festive refreshments there will be many styles of music from jazz to ‘barbershop’. Calder Valley Voices will also be performing. All of this to support the Memory Lane Cafe and Happydays Homeless charity. Tickets can be obtained from June on 01422 706373, Shabir on 07866 369916 or call into the Happydays Cafe & Cycle shop on Town Hall Street HX6 2EA.